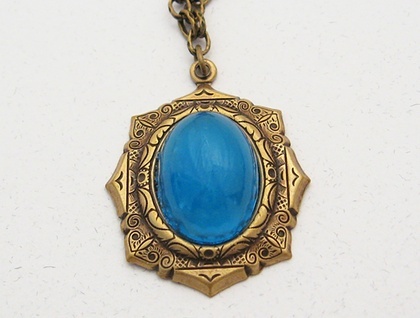 The 'jewel' in this necklace is a vintage German cabochon made of deep, sea-blue glass. 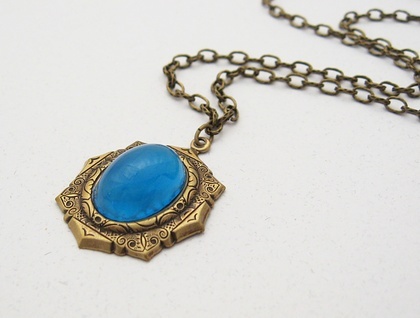 It is set in a highly detailed, ornate, antiqued brass setting. 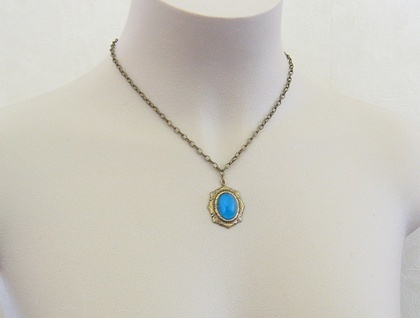 The pendant hangs from an antiqued-brass coloured chain with textured, oval links. The necklace fastens with a lobster-claw clasp, which can be clipped on at any point on the chain, making the necklace easily adjustable. Being vintage, the glass cabochon has tiny bubbles inside it, and slight imperfections on its surface, giving it an ancient feel. The colour is beautiful: a brilliant, almost luminous blue. The necklace measures 46.5cm, including the lobster-claw clasp, while the pendant measures 30mm lengthwise, not including the baile (hanging loop), and 26mm across at its widest point. The cabochon is 18mm long and 13mm wide. 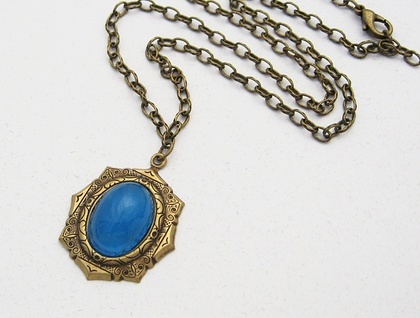 If you would like the chain shorter or longer, just leave me a message in the ‘notes to seller’ field when you purchase this item, stating the length you would like.